Puyallup is a fun place to visit. The Washington State Fair brings in people from all over the region, sports tournaments bring people to the area, people come for business, or just to enjoy the beauty of Washington. With so much happening in the area Puyallup has several accommodations that will fit the bill for any stay. Many hotels have easy access to freeways, dinning, and shopping. You will be sure to enjoy your stay. The Holiday Inn is located five minutes from downtown Puyallup. It serves a complimentary breakfast daily, and each room has a microwave, refrigerator and coffee maker. A gym is accessible during you stay, and a free pass to Bally Total Fitness Center (next door) is provided upon request. Located in downtown Puyallup, this accommodation offers free Wi-Fi, a continental breakfast and gym, in a contemporary design. 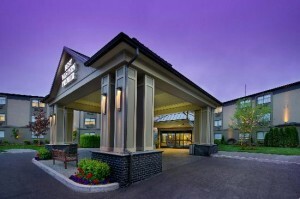 Hampton Inn & Suites provides a comfortable and memorable stay for guests. Located near the Washington State Fair, the Fairfield Inn & Suites is extremely close to downtown Puyallup and local amenities. The hotel offers an indoor pool and hot tub, free Wi-Fi, a continental breakfast, and gym. It has everything you could need for a stay in Puyallup. Located in South Hill, the Best Western is a full service hotel that offers comfort and wonderful customer service. It has great freeway access, and is only a short drive to downtown Puyallup, the mall, and restaurants. This is a great stay if you want the best of both downtown Puyallup and the South Hill area. There is great patio seating, full bar, and indoor pool (for those rainy Washington days). Northwest Motor Inn is located in downtown Puyallup. It is an economical choice of stay that allows you to enjoy nearby amenities. It is extremely close to the Washington State Fair and has great freeway access.